This past Christmas, I received a V-neck T-shirt and a pair of black shorts with blue stripes on it. I think people were trying to tell me something (i.e., "Stop running in men's boxers!!"). Both of these products are from Adidas, made with Clima-Lite material that wicks moisture from the skin. I have worn the shirt once so far and realized I need to wear a better sports bra underneath (I took care of that later) due to a problem I won't mention but I'm sure most would know about. 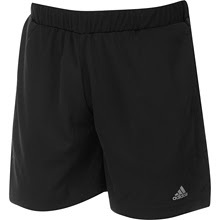 The pictures are not exactly what I have... the blue is slightly less "bright" than that, and my shorts have 3 blue stripes on the side, not black like in this one. On Tuesday, April 8, 2008, I had the privilege of running with a blind runner, Dave Heeley. Heeley is a 50-year-old from England. He embarked on a mission to complete seven marathons in seven days on seven continents. This record-setting attempt is also an awareness cause for the Braille Institute. The first two legs he ran were in Antartica and Brazil, and the third in America. And just by luck, he chose California... Southern California... Pasadena! So I put on my running shoes to join his entourage, which consisted of people running a lap or more from the Pasadena Marathon founders group and kids (contrary to the media releases of this event, I did not see college students). We were blessed with overcast weather and slight breezes at some parts of the route. The event seemed pretty low-key overall. One loop around the Rose Bowl is about 3 miles, so he pretty much did that loop about 8 times. It was a mostly flat loop with some minor inclines that I recall from walks/races I've done in the past. There were water stations at each mile, which also had whole Powerbars (some of their reps were relaying the run as well). I caught the group, which was about 12 in size, at around mile 7 and stayed until mile 16. I wasn't planning on doing so much, but I felt good. We were going at approximately 10:20 pace, very steadily. I could tell he was feeling the energy from hearing the footsteps and breathing around him. I had never run with people before, so what an experience. I'm sure you're wondering how Dave finds his way around (see picture). His sighted guide, Mac, was linked to Dave at the wrist. He definitely deserves props as well. Dave, Mac, and the rest of the entourage were very down-to-Earth, British accents and all. Dave finished in about 4 hours and 35 minutes. The measurement was done informally on a Garmin watch. His next run is in Sydney, Australia and ends in the London Marathon on the 13th. VERY magnificent, I would say. 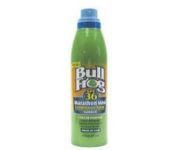 Another Christmas gift I received was this SPF 36 spray sunscreen from Bullfrog. This was my first spray sunscreen, so it took a while to get used to the "cold" feeling that occurs from the spraying, especially on a cold morning. But I think it has helped me protect myself better because I'm more willing to put it on before long runs and races because my hands stay relatively clean and greaseless. It is definitely a good idea to make sure that the spraying covers everything since you're not rubbing everywhere yourself. The California sun can be relentless, so if you miss a spot, you're a goner. Fortunately, the sunscreen leaves a clear layer that disappears after a while but is good for checking the coverage. I don't use this on my face, but I've used it on my scalp, which has prevented sunburn up there. The smell is pretty fresh, a little better than most sunscreens, though I really don't like the smell of sunscreens in general. Nobel4Lit: On 2/5/08, Tea Time posted the following entry. Because I am growing to like these bars even more, I made some updates in green and will continue to add to this as I eat more of them. I am very surprised that I am diggin' these bars, because typically I don't like soft food. I know these bars have been around for awhile but I just recently noticed them showing up at every pre-run expo. Larabar has been out representin' at almost every run expo I've been at. They are always really generous with their samples. I mean to a point. They allow you to pick two samples each time you come around, so depending on how many times you want to walk back and forth to the booths..haha, just kidding. Key Lime Pie: not as bad as I imagined; the one I had was chock full of almonds! I think they recently added a coffee flavor one but I am not sure. What's special with these bars is that they are unprocessed and raw; for those who like raw, hehe. Their claim to fame is that they are energy bars at its purest form. It is basically made of dried fruit and nuts "mooshed" together. They have no added sugar and other stuff some people may find undesirable, but you can read all about that at their website. I am writing this review because at first I was kinda grossed out by these. The sample packages I got were really cute and they looked ok but at first bite, it just tasted strange to me. I guess I am one of those people who are afraid of the taste of "pure"...haha. Anyways, as I said before I've been seeing them at lots of run expos and everytime I walk by their booth, I can't help but take some samples. Lo and behold, I actually fell in love with one of the flavors. I love the Pistachio one. It is one of my favorite things to eat. It's moist, nutty and not too sweet. Can't believe that I actually like this stuff now. Go figure! It's guest review time! I purchased this "fanny" pack thing back in February before the LA Marathon because the bouncing of the CD Logic case I was using to carry stuff for longer races was starting to bother me. I actually found out of this pack from reading an article from latimes.com about marathon preparation. I went to the website http://www.amphipod.com/ and asked the customer service person where I could get one asap since my marathon was less than 2 weeks away. The customer service person was so nice. She could not find a store near me that had one in stock so she offered to waive the shipping cost to me and I accepted. I was really excited when I got it in the mail. I couldn't wait to try it out. This pack is really cool and for $27 it should be. I still experienced some minor bouncing but the other features kinda made up for it. First, the pack is breathable, which means that it allows air to circulate between your back and the pack. Which is nice when you sweat alot. Second, there are so many compartments to put your things and yet it remains really slim and everything stays in place when strapped on. Third, I personally think it looks nice and I am all about running fashion...hahaha. I guess in the end this pack was worth the price to me and I use it all the time on long runs. If I had to do it all over again, I would buy it again. Go to their site and check out all the cool running accessories they offer. Customer service is great too!